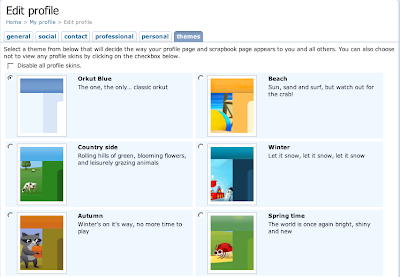 Orkut has launched themes. Orkut has rolled out 12 themes for Indian Users over the last week. This is the second thing they have done India specific after changing the domain name for Indian users. Looks like Orkut has been made India centric, due to the large popularity of Orkut in India.So the themes were launched For Indian Users. [This is a news a few days old but I was not able to post due to my busy End semester schedule] These new themes have been tried and being tested on only a some percentage of Indian Users. But according to This Post at Official Orkut Blog The themes are to be rolled out to all the Indian users within this week. So those who have been privileged enough to receive the update as of yet you can change the theme by clicking the change theme link at top right side of the Orkut page. But for those who haven't had the link as of yet they can use the hack provided by Gaurav at OrkutPlus. The hack uses GreaseMonkey Scripts for FireFox. So enjoy the hacks till the feature is available at your profile. Thanks to Orkut for providing this feature to Indians first. Great Going. Check it out again... Orkut is extending the feature to everyone. Looks like you haven't received the feature yet. Check the link again and if it still doesnot work check out the links for the greasemonkey script for Firefox. That should make it work.